The Jason LX635 was installed at The Cliffs Virtual Villaminium with all available options including the neck pillow with jets. 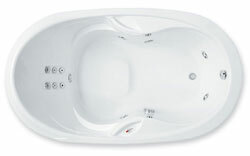 Stunning good looks and advanced hydrotherapy design combine in these 66" by 36" and 72" by 42" whirlpools or Air-Whirlpool baths featuring extra depth, six flow-adjustable Back Stack™ jets, contoured seats for bathing comfort, two integral acrylic handles, and optional jetted neck pillow. Jason’s Whirlpools infuse the sciences of hydrotherapy, massage therapy and reflexology into a bath hydromassage tub that will provide as much relaxation as it does relief. When you experience our hydromassage spa bath you will find that these practices of old enhance your health by improving circulation, stimulating the nerve pathways and relaxing muscles. Jason baths tubs provide you with these types of well being, leisure and healing through Perfect Pressure/Perfect Flow™ hydrotherapy jets that supply a robust, yet gentle flow of water to specific parts of the body. Adjustable jets can be directed to the hands and feet, or to the back and extremities for an optimal massage. All of Jason’s hydrotherapy jets are both directionally and flow-adjustable for the most soothing, rewarding bath. Are you are looking for a deep bath tub or a deep bath soaking experience with your aromatherapy salts? Jason is your choice. So soak and smell the aroma.